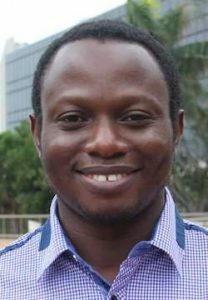 Andrew Okem is a Science Officer (Social Science) in the Durban office of the IPCC Working Group II Technical Support Unit (IPCC WGII TSU). He holds a doctorate in Policy and Development Studies from the University of KwaZulu-Natal, South Africa. Before joining the IPCC WGII TSU in Durban, Okem worked as a Senior Research Fellow of the Maurice Webb Race Relations Unit at the University of KwaZulu-Natal where he managed impact assessment of teacher training programmes. Between 2015 and 2017, he was part of an EU-funded project that examined the poverty reduction co-benefits of climate change projects in Durban, South Africa. Over the years, he has been involved in other projects funded by various organisations including the Bill and Melinda Gates Foundation, the Bremen Overseas Research and Development, Unilever, and the Water Research Commission (South Africa).